Casthouse equipments and consumables: regenerative burners for melting and holding furnaces, movable Injecting carfor melting and holding furnace; degasser, deep bed filter, ceramic foamfilter, aluminium ball and gravel for liquid aluminium filtration, aluminiumball for heat accumulation, launder control pin and spout, fiberglass combo bag,graphite rotors and shafts for degasser, etc. 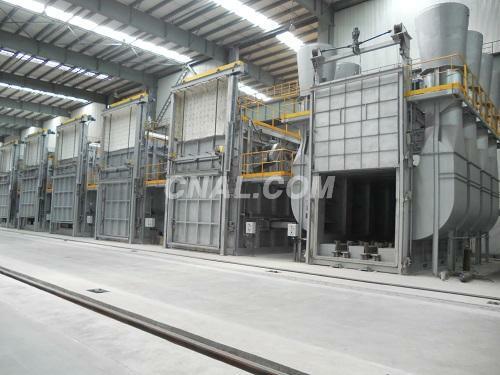 EFR Plate Heat Treatment furnaces foraircraft plate plant, includes: roller hearth furnaces forplate water spraying quenching, aging furnaces for aircraft plate, homogenizingfurnaces for 2XXX, 7XXX alloys and coils, vertical quenching furnaces for thickplate water quenching. EFR Heat Treatment furnaces foraircraft industry in forging plant, includes:rotary furnaces, walk beam furnaces, drop bottom furnaces, box type furnaces,car bottom furnaces, chain type furnaces, belt type furnaces, belt typefurnaces, die heating furnaces, etc.